Viola Frey, "Studio View - Woman and Vase", 1982. Alkyd oil on canvas, ALF-VF-0146PT. Collection of Artists' Legacy Foundation, Oakland. Photography by Michael Tropea, Chicago Art © Artists' Legacy Foundation/Licensed by VAGA, New York, NY. NEW YORK, NY.- The first major exhibition of Viola Frey's work since her death in 2004 will be shown at the Museum of Arts and Design. On view from January 26-May 2, 2010, "Bigger, Better, More: The Art of Viola Frey" will feature Frey's colossal clay figures, sculptures, ceramic plates as well as a selection of her paintings and works on paper. The exhibition was co-organized by the Gardiner Museum, Toronto and the Racine Art Museum, Wisconsin. The installation at MAD is being coordinated by the Museum's curator Lowery Stokes Sims and will include works from the MAD permanent collection and several private collections, as well as two examples of Frey's collaboration with ceramicist Betty Woodman. In addition a selection of popular ceramics from Frey's personal collection which served as an inspiration for her "bricolage" sculptures has been lent by the Artists Legacy Foundation. An installation of works in the collection by California ceramicists, organized by Assistant Curator Elizabeth Edwards Kirrane, will also be on view. "A pioneer of California ceramics known for her colossal clay statues, Viola Frey was one of the most influential sculptors of the twentieth century," states Holly Hotchner, the Museum's Nanette L. Laitman Director. "It is gratifying to present this influential artist. The Museum was the first collecting institution focused entirely on studio craft, and has been a leader in the documentation of this aspect of twentieth-century art. Viola Frey's "Group Series: Questioning Woman I" (1988) is in the Museum's collection and on view in the third-floor gallery." Frey emerged in the complex and often contradictory art world of the 1950's, where painting, craft (specifically ceramics), and design often merged and diverged in dynamic ways. Coming from abstract expressionist traditions in the 1950s, she became involved in ceramics as her contemporaries Peter Voulkos and Robert Arneson were taking this medium to new sculptural and expressive horizons. Frey found her unique style and visual vocabulary in her life-long fascination with mass-produced ceramics figurines which she collected in flea markets combining molded and actual versions of these elements in what are known as her "Bricolage" sculptures. Frey recounted her own life, as well as late-twentieth century culture, through her art. She is a forerunner in self-revelation by creating sculptures and vignettes based on her own personal relationships, recollections and the people she knew. "Frey is best known for her brilliantly colored, literally larger-than-life ceramic figures of domineering men and over-wrought women," notes Sims. "Not only does Frey reveal her early involvement in painting in the dynamic color glazes of the surfaces of these ceramic sculptures, but she also proves to be a perceptive observer of gender and power issues as they specifically played out in mid-twentieth century America." After studying and working in New Orleans and New York, Frey returned to her native San Francisco in the 1960's to devote herself to ceramics, eventually joining the faculty of the California College of Arts. She remained there on staff until she retired in 1999. Early in her career, Frey received major recognition on the west coast in solo and group exhibitions at museums and galleries. 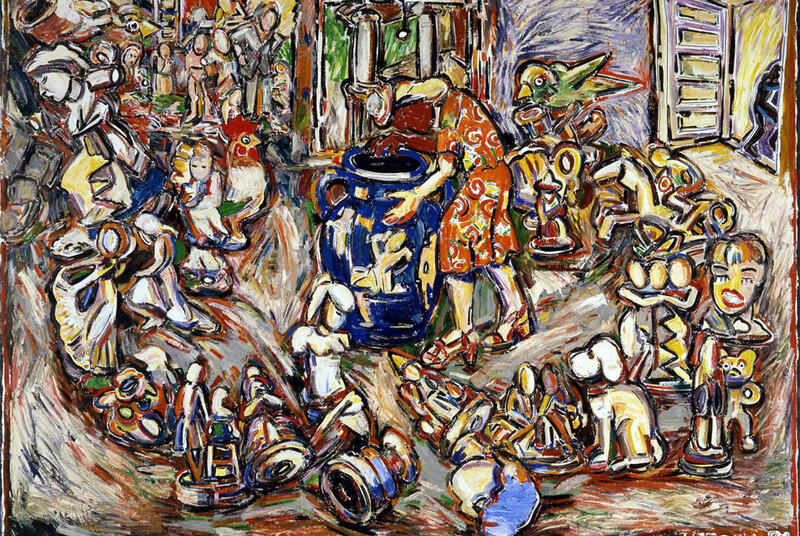 Following an important solo exhibition at the Whitney Museum of American Art in New York in 1984, Frey had almost 50 solo museum and gallery shows across the country, at venues including the Crocker Museum of Art, Sacramento, California; the Fresno Art Museum, Fresno, California; the Rena Bransten Gallery, San Francisco and the Nancy Hoffman Gallery, New York. Her work is represented in museum collections throughout the world, including The Museum of Contemporary Art, Los Angeles; the Museum of Fine Arts, Boston; The Metropolitan Museum of Art, New York; and The Shigaraki Ceramic Cultural Park, Shiga, Japan.